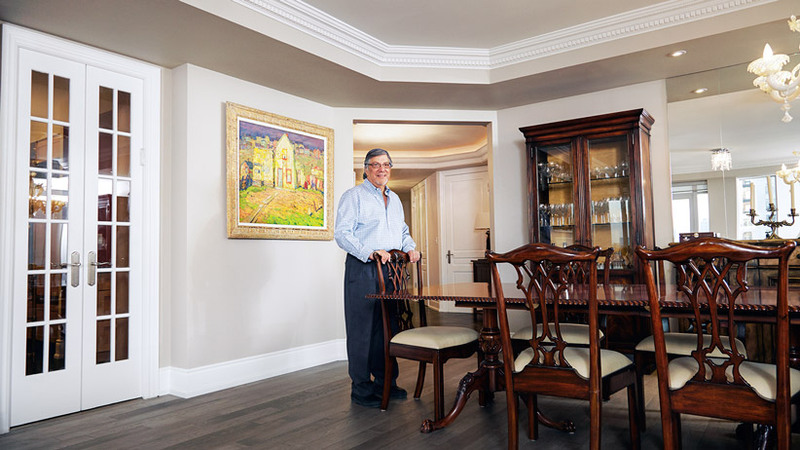 Ephry Merkur, the son of major Group of Seven collectors Max and Reta Mekur, in his house in Toronto. It is only the shock of seeing his name after more than half a century that leads me to write this post. I am very happy to see that he is doing so well. The name I have never forgotten, and the reason I remember you I have also never forgotten. It was the only year I really enjoyed as a camper, although the other councillor I also recall with a great deal of affection was Mike Saxe. If his name comes up some day, I will not be as sure that it would be the same Mike Saxe, but there must be only one person in Toronto, in Canada, with yours. I won’t go into too much detail, partly because there isn’t a lot of detail left. But for what it’s worth, and when I think back on it now, it comes to mind that what I truly recall is that you were the only person I ever dealt with, in all the years of camping, that brought a philosophical dimension to it. I wasn’t much of a swimmer, hiker, sailer, canoer (OK canoeist) or the rest, but I did like thinking about things. I know why I associate this with you, but even that I won’t get into. But had they sent me to Camp Plato instead of Playtime [the actual name of the camp I went to] I think it might have suited me a lot better. So you were, in a sense, the Maimonides of my camping experience. In fact, the book you had with you at the time, and which I then came back home and made my parents buy for me in spite of its ridiculous price, I have with me still. It remains one of the most important books of my life, which I was telling my children about not all that long ago. And if you are wondering about any of this, I can only tell you that I will say not another thing about any of it. These are my memories, and I do not intend to have them disturbed by someone else’s version of events. In keeping with all of the above, I am now a university professor in Australia, and have been here for forty years. I won’t blame you for leading me in this direction, but you were one of the first to help me see the elements of my own nature and character. So there is a lot of gratitude in my writing to you, and unlike most of my camping experience, all of my memories of you are warm. And they are genuine memories, as long ago as this seems to have been. It was very exciting to see these Group of Seven paintings found like this. Your parents must have had such a good eye for these things to have known then what the rest of us knew only later. I also loved the picture of your home which looks fantastic. You must have been as good a lawyer as you were a councillor. Thank you for putting your reply up on my blog. If you are ever in Melbourne, you are more than welcome. I can only hope that my name doesn’t ring a bell, and if it does, please don’t mention a thing. In thinking this over, “Mike Saxe” was no doubt Mike Sachs who I also remember with great fondness. He was the only councillor who was truly different. What I remember about him best was leading us – Cabin 4 – while we were camping on the shores of Lake Watchimicallit, on an Indian raiding party on Cabin 3, who were camping at a different site about a mile up the lake. This was at night and we had to travel more than a mile through the woods. The moment we arrived at the edge of their campsite must have reprised a primordial moment in the history of the human race. They were going about doing what they did around their camp fire, with not a care in the world, while we surrounded them in the dark of the forest. For us, it was just fun – and they would later attack us in a similar way to even things up – also through motives I expect are primordial in origin – but fun though it was, its darker side has never left me. This entry was posted in Law of Markets and tagged Ephry Merkur by lawofmarkets. Bookmark the permalink.